The Kentucky County Fair pageant was held recently in Louisville, Kentucky. Three local young ladies received the honor of making the top 15 out of 78 contestants from across the Bluegrass. Amber Allen, daughter of Cheryl Upchurch, Taya Cook, daughter of Kevin and Tammy Cook, and Bailey Gibson, daughter of Amy Gibson and Mark Gibson, were all named to the top 15 at the pageant. 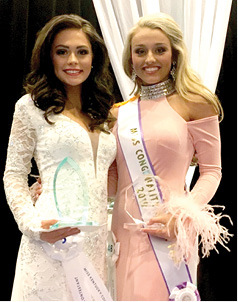 Taya Cook was also named first runner up in the pageant and Bailey Gibson was named Miss Congeniality.